This paper explores the source of an unexpectedly large number of particles found while examining the rough pumping cycles of a vacuum system. It is proposed that these particles are generated through nucleation of moisture onto fine particles during pumpdown, and that turbulence enhances this process. A brief discussion about the particle monitor used for data acquisition and a review of previous experimental results on the dependency of particle generation on turbulence is included. The body of the paper contains experimental results supporting the nucleation hypothesis, and a discussion on the effects and prevention of particle nucleation. The experimental results include a comparison of particle generation for two gases of similar original particle content but different humidity levels, reduction of particle count using a molecular sieve to remove the moisture in the chamber, and a systematic change of the relative humidity (by adding or removing moisture) in the chamber. 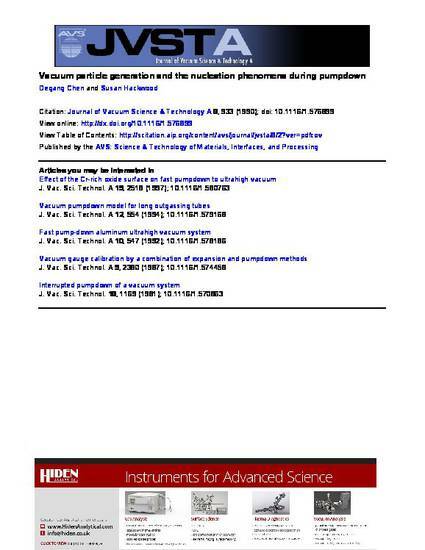 The following article appeared in Journal of Vacuum Science & Technology A 8,2 (1990); 933 and may be found at doi: 10.1116/1.576899. Posted with permission.